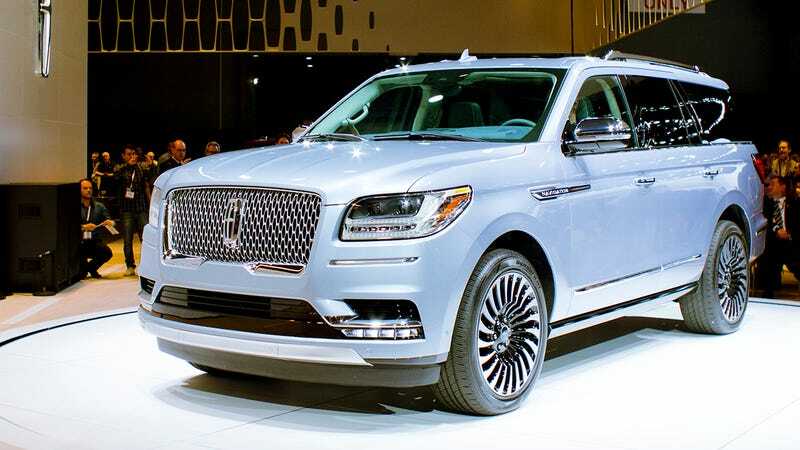 The last Lincoln Navigator was a heinous monstrosity. It was awful in virtually every way. It was a beaked terror, and a relic from Lincoln’s shameful recent past. But the new 2018 Lincoln Navigator actually looks like it might be the large and interesting truck that Lincoln finally deserves. I really cannot overstate how atrocious the last Navigator was. It would wallow. It would bow. It would bounce and bump. It was large without style. It was a study in faux opulence. Mysterious, terrible smells would invade the cabin. At first I thought it was me, or maybe the car itself. But no, after a while I figured out it was just general New York City filth. The HVAC filter didn’t quite, well, work. I eventually put it on my list of the worst cars of 2015. But this new Lincoln, this certainly seems different. Obviously, I haven’t driven it yet, being that the thing was unveiled literally this past midnight, but this thing looks good. Yes, it’s big, but it’s got style to match. It has huge turbine wheels. It’s got smooth corners. The TV remote-sized Lincoln logo in the center of the grille lights up. Really. It’s tacky as hell. It’s also wonderful. It’s a cliche, but Lincolns really did used to be paragons of style, what with the 1961 Lincoln Continental and all. I’m not sure I’d call the new Navigator a paragon of style, but it sure as hell does look much better than the last one, as Elvis intended. And it should be better overall, too, with Lincoln saying that it has 75 new technologies and features over the last one. Inside it’s all snazzy blue-ish gray leather, big screens to which you can stream movies from your phone, and a gas pedal with 450 horsepower and 500 lb-ft of torque (which Lincoln has not confirmed, but it sounds like it’s the same Ecoboost engine out of the F-150 Raptor) to propel its aluminum body. Lincoln has said anything about the weight yet, and I’m sure it’ll still be hefty, but that mill should be more than adequate to actually get the thing moving. But is it a Good Car? Who knows, but this is a hell of a good start.